Script files may contain sensitive information such as passwords, user names or remote server information. When ScriptFTP is deployed on many workstations it is advisable to encrypt the script files in order to prevent users from reading the script content. For encrypting a script file you will have to ask for a small tool at support@scriptftp.com. The encryption process will leave the file name and extension unaltered and renders the content of the script file unreadable. 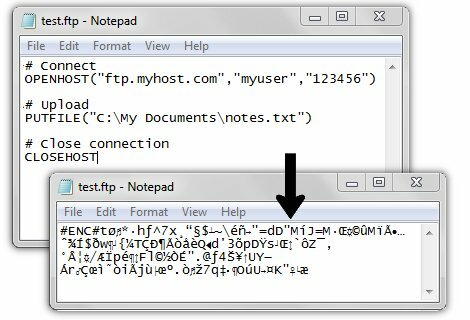 ScriptFTP will treat the encrypted file as a normal script file.